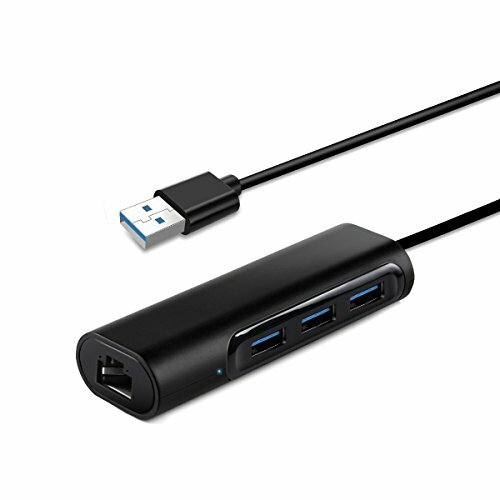 The Cable Matters 3-Port SuperSpeed USB 3.0 Hub with Gigabit Ethernet is an essential companion for a desktop, laptop, or tablet computer with USB. Instantly add 3 USB 3.0 ports and a Gigabit Ethernet network connection from a single USB port. You can transfer files or sync data from an USB flash disk or other external disks to your computer at high speed up to 5Gbps. Also, you can connect to mouse, keyboard or other external USB devices through three USB 3.0 interfaces. The adapter is a perfect accessory for adding a standard RJ45 port to your Ultrabook, notebook, or Macbook for file transferring, video conferencing, gaming, and HD video streaming.Support 10/100/1000 Mbps fast network access. Linux kernel 3.x/2.6, and Chrome OS "
Super Speed Data Transfer: Add 3 USB 3.0 Super Speed ports to your PC, up to 5Gbps for faster sync times. It is backward compatible with USB 2.0/1.1 devices. High-powered Ethernet Adapter: This LAN Network Adapter can offes 10/100/1000 Mbps fast Ethernet performance over USB 3.0 and Ethernet ports, faster and more reliable than most wireless connections. WHAT YOU GET: 1* Ethernet Adapter with 3 USB 3.0 ports, 12-month warranty and friendly customer service. If you have any questions about this product by Smart Tech, contact us by completing and submitting the form below. If you are looking for a specif part number, please include it with your message.